The concept of the militia originated in England and was brought over to the colonies. The local militia was necessary to protect against marauding bandits and invasion as well as reducing the need for a professional army. Americans were suspect of professional armies, watching standing armies in Europe become the tool of dictatorial powers. Prior to the Civil War, the individual states largely governed and maintained the affairs for themselves with less influence or regulation by the Federal government. (It was this growing shift to a more central Federal government and the resistance to this shift that actually lead to the War.) Because of this, militias were the primary means for defense. Militias could also be local, but each state made provisions for a state militia. The Missouri State Guard was such a state volunteer militia raised by the elected state government to defend the state of Missouri from invasion. The following is its origin and history. It is necessary to first revisit the historical conditions and situations in Missouri that necessitated the creation of the Missouri State Guard. In February/March, 1861, a convention attended by elected delegates from state senatorial districts, was held in Jefferson City and St. Louis. Among other business, the resolution of the convention decided "at present" there wasn't cause to secede from the Union. If further implied secession would come if the North used force against those states which had already seceded or against those who may decide to leave. Missouri hoped it, and other border states would remain in the Union and be a buffer, but there was a limit to what Missourians would endure from the North. It now became apparent to Governor Claiborne F. Jackson the state needed to assume a position of armed neutrality through assembling and maintaining a strong militia. Even the moderate thinkers agreed with this position because a potent militia force would prevent or discourage the North from using Missouri as an invasion corridor to the South. Missouri, basically wanted to be left alone. This was a key point the Federals failed to grasp. A short few weeks later on April 15th, the Secretary of War under President Lincoln, issued an order for the State of Missouri to provide troops for Union service. On the 17th, Governor Jackson replied: "Your dispatch of the 15th instant, making a call on Missouri for four regiments of men for immediate service, has been received. There can be, I apprehend, no doubt but these men are intended to form a part of the President's army to make war on the people of the seceded states. Your requisition, in my judgment, is illegal, unconstitutional, and revolutionary in its objectives, inhumane and diabolical and cannot be complied with. Not one man will the State of Missouri furnish to carry on such an unholy crusade." Steps to raise the militia were certainly now set in motion. The state didn't have money to purchase weapons or supplies, however there was a federal arsenal on Missouri soil in St. Louis that held plenty and could be taken by force. The governor invoked his constitutional power to assemble the militia shortly after May 3, 1861. Brigadier General of the militia, Daniel Frost, would conduct the encampment on the hills overlooking the arsenal. The ruse of military drilling would position them in perfect siege position. A request had gone out to Confederate President Jefferson Davis for siege cannons and other supplies which arrived from Louisiana in large crates marked "marble." This combination of factors would surely force the surrender of the arsenal hopefully without a shot fired. Nathaniel Lyon was in charge of 400 regular Federal soldiers and also had at his disposal a large number of pro-Union German quasi-military units. Lyon mistrusted the assembly of the militia and moved the contents of the arsenal to Illinois. Outnumbering the militia troops six-to-one, Lyon called for their surrender and the militia had no other choice. The militia men were being marched away with the German captors all around them down civilian- filled streets. Things turned ugly and a shot rang out. A German command was heard and then a volley of musket fire into the civilians. Other companies did the same while civilians fell to the ground and then fled in panic. When things cleared there were twenty-eight dead including several women and an infant. The incidents continued the following day which left twelve more citizens dead. The reaction was consistent throughout the state. Shock and indignation that Union troops had killed Missouri citizens. Volunteer and uniformed local militias formed and headed to Jefferson City to offer their services to the Governor. Within a few hours the news of the massacre reached Jefferson City. The enraged, and now armed, House of Representatives formed and passed a military bill giving the governor legal and financial resources. This bill became law on May 14, 1861, and created the Missouri State Guard. It was hoped the presence of the Missouri State Guard would serve as a deterrent to Union invasion. Sterling Price was chosen to head the Missouri State Guard. He had served the state for 20 years in the Missouri House, as governor and as a United States representative. He was also a Mexican War veteran returning as a brevet brigadier general. He had many admirers and was described as courteous, dignified, well-educated and greatly endowed with "common sense." He was an excellent leader and motivator, and would be remembered as one of the great Southern generals of the Civil War. ready or not. 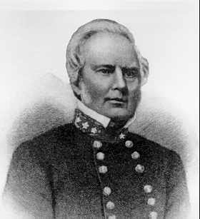 In effect, General Lyon and the federal government had declared war on Missouri and sent regiments to attack a state that had not seceded from the Union. This certainly forced the state to ally itself with the Confederacy. It was not known how many Missouri State Guardsmen Price could rely on and even though money was appropriated, it was only $30,000. The state could not provide much more than six canon and a small amount of powder. The Guardsmen were loosely organized at best and brought whatever arms they had at home, if any. These were generally hunting rifles or shotguns. They had no uniforms and wore their everyday clothes, old Mexican War/Indian war/Federal uniforms, etc. They did however create a flag to rally behind which was a banner of blue wool six by five feet, with the Missouri coat of arms in gold. Meanwhile, with Union troops advancing it was deemed necessary to take the MSG south to have time to train and members of the state government, including the Governor fled south as well. The Missouri state government was a legally constituted government which had been forced to be a government in exile and the Missouri State Guard soldiers were sworn to uphold that government. After the elected state government fled, the Federals installed a provisional, Union-friendly government in Jefferson City. but their greatest strength was they were full of fighting spirit. They weren't fighting for pay and they didn't ask for any." The disorganized and inexperienced image was somewhat erased when the MSG proved it could fight by winning the Battle of Carthage on July 5th, 1861. Then on August 10th, fighting alongside Confederate forces from Texas, Arkansas, and Louisiana, but seeing the most action, the MSG defeated Union forces at the Battle of Wilson's Creek which forced the Union forces to retreat back to Rolla. From here General Sterling Price wanted to push north and take the north and western portions of Missouri, but required Confederate General McCulloch's troop and logistical support. McCulloch despised the MSG because they were undisciplined and unpolished, fearing it would be detrimental to his troop's moral. He also harbored resentment toward the Guard because the Guard was adept at picking up enemy weapons, ammunition, clothing and supplies McCulloch felt should become the property of his Confederate forces. It also didn't help McCulloch's ego for he knew full well it was the scorned MSG that fought better than his forces at Wilson's Creek and that General Price was an exceptional commander and leader. Further, McCulloch was responsible for Arkansas and the Indian Territory of Oklahoma and did not want to leave south Missouri border area. General Price and the MSG went it alone and went on to win the famous Battle of Lexington. Because Southern forces were unable to mount an effective campaign on the east side of the State, the Union was left to go after General Price and the MSG, dislodging them from Lexington and again forcing a retreat to the south to buy time and replenish the ranks. Though not always reported in the history books, Missouri seceded and joined the Confederacy on November 28, 1861. Governor Jackson suggested MSG veterans join the Confederate army and receive back pay, but many resisted because such enlistment was for the entire war and would possibly mean deployment to other states rather than "in defense of their homes." Missouri Guardsmen did enlist in sufficient numbers to fill two Missouri brigades however. The MSG did exist in diminished numbers for most of 1862 but was attached to the Confederate army for logistical support. On March 7th, 1862, the Missouri State Guard was one of few units that fought admirably at Pea Ridge and was instrumental in driving Union forces from the field at Elkhorn Tavern which had been the heart of the Federal defense. Poor Confederate leadership including a lack of logistical support however necessitated the retreat of all forces on March 8th. This was largely because General Van Dorn who was in command of all Southern forces at Pea Ridge had abandoned his supply wagons prior to the battle and the MSG and other forces were almost out of ammunition by 10:00 a.m. on the morning of March 8th. On April 8th, General Price accepted a commission as a Major General in the Confederate army and asked his Guardsmen to follow him. Most did, some did not. The Missouri State Guard was present at the evacuation of Corinth, MS on May 30, 1862, but was recalled to Arkansas shortly after. On September 14, Governor Jackson wrote an order putting an end to the Missouri State Guard by merging it into the (Trans-Mississippi) Confederate army. At it's peak and by best estimates, the Missouri State Guard consisted of 27 regiments and 3 battalions of cavalry, 10 batteries of artillery, 27 regiments and 11 battalions of infantry for a minimum of 18,230 men. According to available records the MSG fought in over 100 battles, engagements and skirmishes in first year of the Civil War. Though they were "homespun", unethical and unpolished, not even the late General McCulloch would deny the Missouri State Guard could fight and was a big and important thorn in the side of the Union army's attempt to subjugate Missouri.